Debra Claffey was recently interviewed by Kimberly Curry. 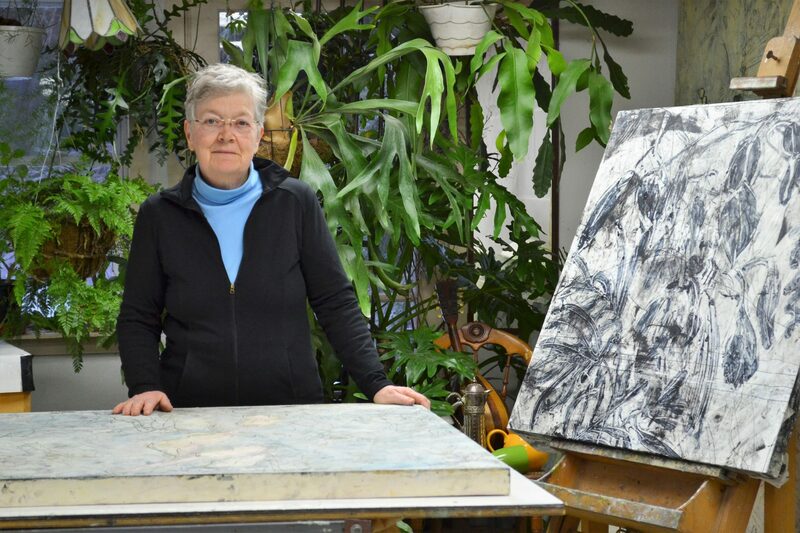 Deb Claffey in her studio. I grew up in Connecticut, the oldest of eight children, until my family moved to Massachusetts and I graduated from high school in West Springfield. My mom did a lot of crafts at home, especially for Christmas decorating. I have memories of entering a poster contest and a flower-arranging competition. I learned from my mom how to make my own clothes. I loved art classes in school, but never thought of myself as artistic. I was persuaded to go to college as an English major on track for teaching. I was such a big reader that it was easy to persuade me. The late 60s were turbulent times that made me question my direction and I went looking for something to challenge and absorb me. I started painting in my late twenties, with a night course at the local state college. I enrolled in day classes and studied with Arno Maris, an alumus of the School of the Museum of Fine Arts. I transferred there in the late 70s, and finished with a BFA in Painting in 1981. I had a studio in an old brewery building in Jamaica Plain, where I worked for eighteen years. I helped establish Jamaica Plain’s Open Studios. My work at that time was all about jazz and music, and since my husband was the resident jazz pianist at Turner Fisheries in the Westin Hotel, I had plenty of material. Now I live and paint in southern New Hampshire, near Manchester, on a wooded 5-acre lot. We have a log house with a small former horse barn for my studio. I am learning how to grow vegetables and have a passion for plants and the natural order of things. The natural world, especially the plant world, is my inspiration. My classes at the University of New Hampshire on photosynthesis and soil science were so full of amazing facts about the intelligence of plants, the life in the soil, the awesome capability of bacteria, and fungi. I could go on and on about trees and mosses, and algae. We live amidst a miraculous self-sustaining interlocking complexity of astonishing life. I’m trained as a painter in oils. I studied with Ellen Banks and Sandi Slone at the School of the Museum of Fine Arts in Boston. In the early 1980s, I found a book on wax painting in the library. I photocopied the chapter on hot wax and the chapter on cold wax. I experimented with making some encaustic paint with beeswax and powdered pigments. I made two paintings on Rives BFK paper, and one on gessoed Masonite – still-life paintings of vases of flowers. I discovered that, without a mill, I could not get the powdered pigments finely ground enough, and put encaustic aside. 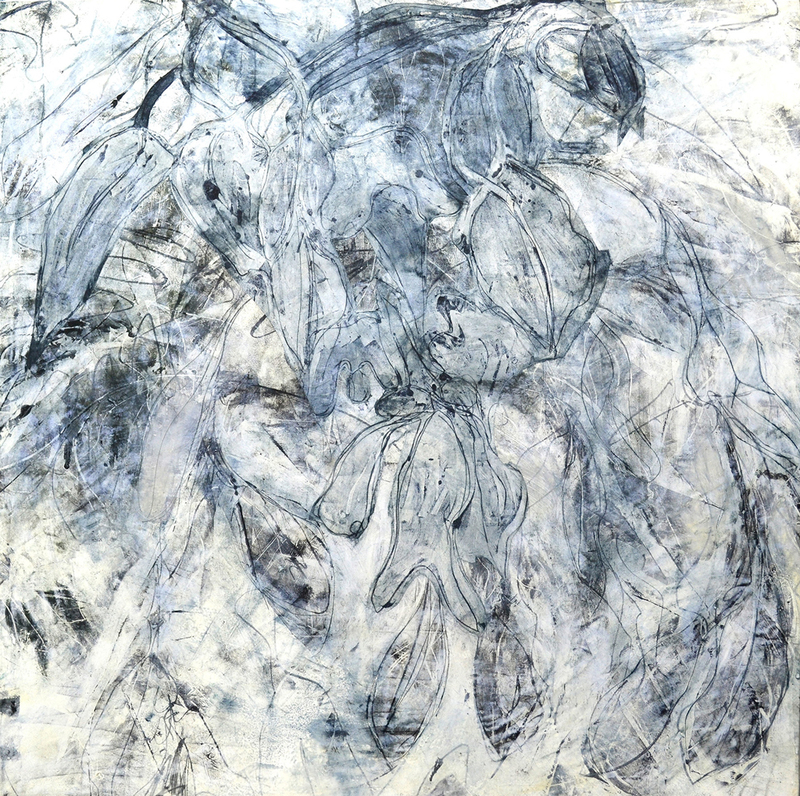 Years later I read that a group was being formed in Maine by Kim Bernard, and that, plus Joanne Mattera’s book, The Art of Encaustic Painting, and R & F Paints in Kingston, New York, were the catalysts to returning to using encaustic as my medium. I notice that I have slowly limited the variables. I have reduced the number of sizes I work in to three or four. This, and working mostly on panels, has saved many hours and much expense in framing, matting, and putting together groupings of paintings that work well together. After many, many years of trying out lots of mediums, I have reined in the impulses, and settled on oil, wax, drawing, and monotypes. Another change that I have noticed is that, in my series, the focus of my content lasts many years longer than in the past. This drilling down and simplifying seems to help me make the work as powerful as possible. How do you work? Do you sketch or plan for a piece or does your art evolve during the process? It seems that the more I plan a work or a series of work, the less it evolves during the process. Very often, though, the new piece takes off on something that worked well in the previous piece. Here’s a work scenario for the latest series: I start a drawing on a panel; that spawns a trace monotype. I add a layer to the panel and take another monotype. This will continue until the panel tells me to stop. Then I start a new panel with a layer of encaustic, fuse the monotype into it, and begin adding layers of drawing, encaustic, and incising on it. If it works well, it’s done, and I stop. If it won’t resolve, then I’ll repeat the paint/monotype/draw/paint process. Do you use other mediums or exclusively work in wax? I use wax as one element in my tool box. 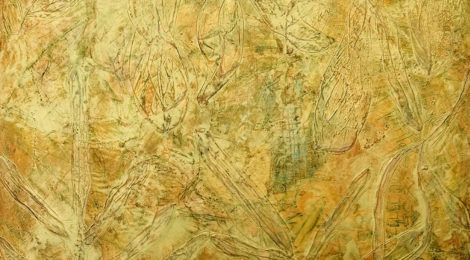 I have a large body of work that is done exclusively with encaustic, applied molten with all layers fused. 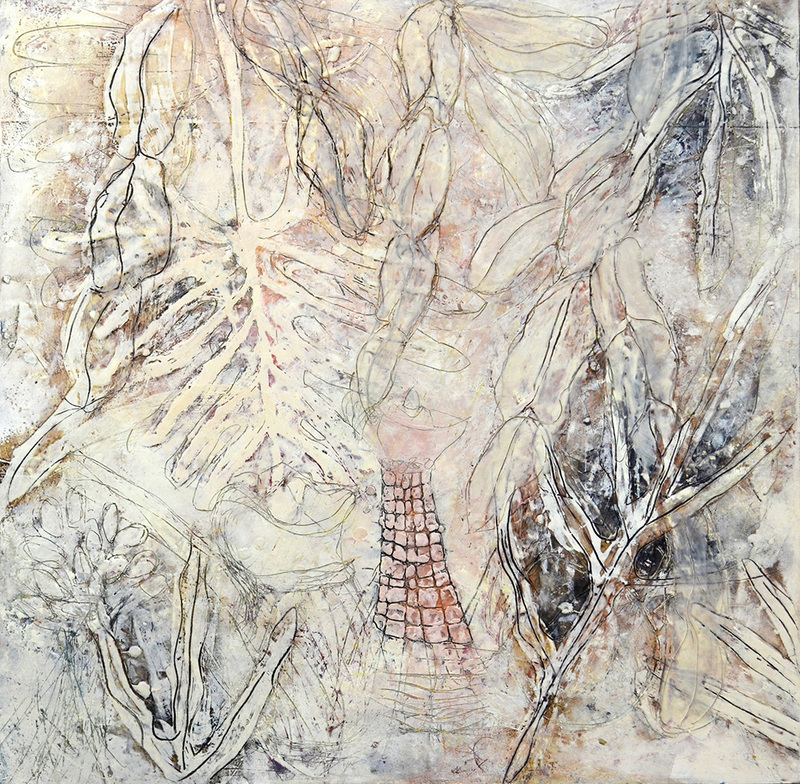 But my recent work is no longer technically encaustic, since it is a mixture of print-making, layers of oil, oil and wax paste, and/or encaustic, drawing, and sometimes collaged elements. Do you have other jobs other than making art? Since 1981, I have always worked free-lance and part-time jobs to support my art-making. I have worked in graphic design and sign-making, bookkeeping and office management, computer data entry, stock-price charting, or database design. In 2001 I started Artful Gardener Professional Garden Care, a garden maintenance and design company, with a crew of three gardeners. Two years ago I reorganized the company and now maintain two special residential gardens with my crew. 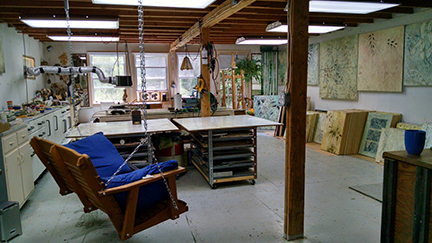 I have recently begun teaching from my studio, offering introductory workshops in encaustic, painting with cold wax medium, monotypes, and mixed-media painting. I’m once again working free-lance as a website manager for two artist groups, and doing a bit of work as Senior Editor of the online publication ProWax Journal. Hmm, I built a ham radio and learned Morse code when I was young, rebuilt and restored a diesel Land-Rover in my twenties, and at one of my many jobs, drove a Cain’s delivery van on a grocery-store route. I’ve been blessed with an interesting life! Great to read all about Deb. Such a talented and busy person! A very busy, productive and helpful person. Very happy to learn more about you and your work. An extensive resume and interesting life story. Outstanding artwork, important artist from New Hampshire! Loved learning more about an artist I admire. How wonderful to read more about you and your life Deb! So rich and creative! What a great interview! Thank you Kim and Deb! This article was such a pleasure to read. There is the bonus of Debra and that very lush background. This is just fabulous! I now have more questions for you. Absolutely love the first pic with you and your plants. And your studio looks dreamy. I love that swing! Fascinating article which demonstrates the creative approach to a life, how it takes many twists and turns. The clarity in thought is so awesome and is projected in her finished works.